AShok says to Bindu that i want to present a play, i hope everyone will see their life in it, he sings, then some artist comes and perform a love story, two pious people are shown loving each other, Bindu and Dharma sees this and recalls their time together, Dharma is in tears, the artist marry each other like Bindu married Dharma, Ashok says it was love beyond everything, Shiv was sad as he lost his love Sati, Bindu recalls how he left Dharma after giving her ring, Dharma looks at her, it is shown that Sati is surrounded by fire, Khurasan looks on, soldier tel something to Khurasan, Khurasan leaves from there. Khurasan comes to record analyst and ask Bindu’s son’s name, he says i dont know else i would have told Bindu, Khurasan says if you dont tell me then you will lose your life, he says i dont know, Khurasan hits him with sword. Play is going on in court, Shiv fights with enemies and Sati comes to meet him, they are lost in each other, Bindu recalls how he saw Dharma in palace after 14years, Khurasan comes back, Shiv and Parvati(Sati) are united, then comes their son, AShok comes there and fights with enemy in play, enemy dies, Bindu gets happy seeing this, Dharma smiles at AShok, Ashok looks at her, she points at him and starts leaving from there, Radha points Ashok too and leaves, Khurasan is noticing this, Khurasan looks at lady leaving court, he sees her face and is shocked to see its Dharma, he goes behind her. Radha says to himself that Ashok have followed Chanakya’s orders but we have to see how he will stop Khurasan from reaching Dharma, a small mistake can destroy everything. In court, Bindu says it was great play, i thought i was part of it, i will reward everyone who was in this play, Sushim thinks that he showed lie as truth by a play, Bindu ask where is Ashok? Helena thinks that Ashok must have taken Khurasan to meet Dharma. Soldier congratulate Bindu for Sushim and Ahenkara’s marriage, Helena diverts his attention from Ashok. Ashok comes to Khurasan and ask what are you doing here? khurasan says i saw Dharma, Ashok says i was going to tell you same, they were going upstairs, Khurasan says lets go there then, AShok thinks that i hope he doesnt hurt my mother. Noor is not letting Bindu go anywhere, Charu says to Khalatak that Noor is not leaving him for a second, Khalatak says she is insecure of your success, Charu says i should thank Helena, she approved my proposal and talked to Bindu about this marriage. Niharika ask Helena will Khurasan be able to handle Dharma? Helena ask her to be calm, Niharika says i am tensed, Charu comes and says dont worry, Ahenkara is like my daughter, we will take care of her, Bindu has no daughter so he will take care of her alot, Niharika smiles. Sushim and Ahenkara are standing together, Sushim’s friend Amarjeet who misbehaved with Ahenkara comes her and says now you are our princess, he touches her feet, Ahenkare feels uneasy and moves back, he says seems like you have not forgiven me for my earlier mistake, she says i have forgiven you. Niharika says to Helena that i am tensed, i will go and see Khurasan, Charu comes to her and says i wanna make you meet some friends, she takes her. Ahenkara thinks that Ashok is not seen for much time, i should tell Niharika, she is about to leave but Sushim holds her hand and ask where are you going? she says i want to talk to mother, he says tell me what you wanna say? i am your life partner, i know you are going to see Ashok, he is not seen for sometime and you are so impatient? Ahenkara sys you are cheap, Ashok is is putting his life in danger to find your brother and you.. she leaves, Sushim says i will kill Ashok before Ahenkara, he has snatched everything from me, first my father’s love and my first love Ahenkara. Ashok and Khurasan are going upstairs from secret way, they find foot marks there, Ashok says seems like someone was here, Khurasan says seems like someone was hiding here, Ashok finds food plate there and says seems like they were here from many days, Khurasan says this means Dharma and her son are on roof top, he starts going upstairs, Ashok smirks and follows him, Khurasan thinks that they must be hiding on roof but Ashok is with me and i dont want Ashok to see me killing them, he ask Ashok to go and bring some soldiers, Ashok says but Dharma and her son want to meet me, i should inform Bindu, he will come here, Khurasan says do as i say else.. he brings out his sword, Ashok says i am with you and you are warning me only? i should tell Bindu about all this, Khurasan says you wont be able to reach Bindu, he attacks Ashok, Ashok takes out his sword and fight with him, he ask Khurasan why you are doing this? why you are not letting me know Bindu all this, Khurasan says you have made me reach Dharma, your work is done, Ashok says i promised Bindu to bring truth of Dharma to him, my work isnt finished, Khurasan says you have done alot for me but now i will do my work, he fights with him, he pushes Ashok against window and throws him down, Ashok falls and shouts maa. Dharma is on roof and gets tensed for Ashok on otherside and says if Ashok is fine? why he didnt come till now? Bindu says to Helena that you have made my birthday very special, you have given me so much strength to bear all this tension,, Helena says every mother wants her son to be happy, Bindu sys i want to end this day on happy note, i want to have an sketch of all family members together, i have called all wives and sons, they will be here. All royal family members gather together, Niharika thinks i should go and find Khurasan, all family members are standing together so that sketch can be made, Helena says i am tired, i am going to room, Drupat says please be with us, whole family’s sketch should be made together, Helena agrees and stays back. Khurasan says now Ashok is removed from my way. Dharma is on roof, waiting for Ashok. Khurasan comes on rook and opens door of room, Dharma is shocked to see Khurasan with sword, she shouts, he is stunned to actually see her, he says DHARMA and smirk, he start coming near her, she ask where is Ashok? what you did with him? Khurasan says he is dead, Dharma is shocked and says no.. she falls on ground, he says when you are so much sad to listen about Ashok’s death then what will happen to you when i will kill your son infront of your eyes. AShok has not fallen but was hanging on wall, he starts climbing the wall to go upstairs, he says i cant rely on Bindu or anyone to protect my mother. Khurasan ask Dharma where is her son? why did you come here? you were living peacefully for 14 years, i was not following you but you came here, you should have atleast thought about your son. Ashok climbs wall and jumps in building from window, he finds his sword, he takes his sword and says Khurasan i wont let you succeed at any cost. Dharma is crying and says AShok.. Ashok comes there, Dharma gets happy seeing him, Khurasan is stunned to see him alive, Dharma runs to Ashok and cries, she hugs him, Ashok gets emotional too, Khurasan looks on confused, Dharma ask Ashok my son are you fine? Ashok says i am fine Maa, nothing happened to me, Khurasan says Ashok is your son? he recalls how Ashok was fooling him all the while, he says now i understand your plan, he says to Dharma that you couldnt come infront of Bindu so you had sent your son to him so that he can win his trust and when he gets to know about Ashok’s truth then he will make him heir, he says to Ashok that you are very clever, you said to Bindu that your mother is dead, you went to royal school so become heir but when it also didnt work so you cheated maurya family, Ashok says this is not truth, Khurasan ask what proof you have? 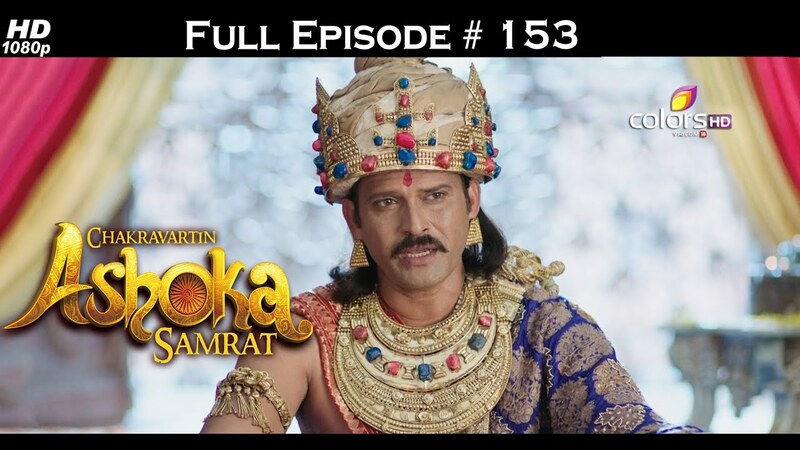 AShok says truth needs not proof, he fights with Khurasan, Dharma shouts Ashok.. Ashok looks at her, Khurasan throws away his sword in moment, Khurasan is about to kill Dharma but AShok sit on his feet and ask him to stop, Khurasan says to Dharma that you lost last chance to live, Khurasan says to Ashok that you and your mother will die from my hands and you both will be remembered as betrayers, Ashok says no, you wanna kill us both? kill us but dont malign my mother’s name, i couldnt give her respect what she deserve in life but let her have respectful death, dont show her as betrayer after death, Khurasan says what will i say to Bindu? i asked Niharika to present Dharma as betrayer as i was in danger, Bindu was doubting me, now i will put all blame on you, what i couldnt do 14 years back, i will do it now, Khurasan is about to hit AShok with sword but Bindu comes inbetween and stops Khurasan by putting his sword on his, Dharma and Ashok looks on.